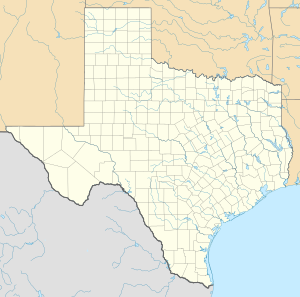 Dyess Air Force Base (AFB) (IATA: DYS, ICAO: KDYS, FAA LID: DYS) is a United States Air Force base located approximately 7 miles (11 km) southwest of Abilene, Texas. Dyess AFB is a 6,409-acre (25.94 km2) base with over 13,000 military and civilian people. It is home to the 7th Bomb Wing, which consists of four groups. Two squadrons, the 9th and 28th Bomb Squadrons, fly the B-1B. In addition, the 28th Bomb Squadron is the Air Force schoolhouse for all B-1B aircrew members. The base is located in the southwest corner of Abilene, TX and is about 200 miles (320 km) west of Dallas. The base employs more than 5,000 people, making it the single largest employer in the area. Dyess AFB has nearly 200 facilities on base, plus 988 units of family housing, and encompasses 6,117 acres (24.75 km2) of land. The base has a total economic impact of nearly $310 million yearly on the local community. The host unit at Dyess is the 7th Bomb Wing (7 BW) of the Global Strike Command (GSC), which was activated on 1 October 1993. The 7 BW performs combat training with the Boeing B-1B Lancer bomber and is the Air Force's premier operational B-1B unit with 36 aircraft. Responsible for executing global conventional bombing directed by proper command authority. It is the Air Force's largest B-1 operations group comprising 36 B-1s. The 317th Airlift Wing (317 AW), an Air Mobility Command (AMC) tenant unit, performs Lockheed Martin C-130J Super Hercules airlift missions with 28 aircraft assigned. The 317th Airlift Wing is now the largest C-130J unit in the world. Dyess AFB is also home to several tenant units, including Air Force Office of Special Investigations (AFOSI) Detachment 222. The base is named after Lt Col William Edwin Dyess, a native of Albany, Texas, who was captured by the Japanese on Bataan in April 1942. Dyess escaped in April 1943 and fought with guerilla forces on Mindanao until evacuated by submarine in July 1943. During retraining in the United States, his P-38 Lightning caught fire in flight on 23 December 1943 near Burbank, CA. He refused to bail out over a populated area and died in the crash of his P-38 in a vacant lot. In 1942, the United States Army Air Forces built Tye Army Air Field, as it was popularly known, on the site of what is now known as Dyess AFB. On 18 December 1942, the field was opened and was initially named Abilene Army Air Base. The name was changed on 8 April 1943 to Abilene Army Airfield. The first host unit as Abilene AAB was the 474th Base HQ and Airbase Squadron, established on 18 December 1942. The airfield was initially assigned to Second Air Force and its mission was to be a flying training center for cadets. The 77th and 69th groups were units that trained reconnaissance personnel who later served overseas. The 408th was a new group which received A-24, A-26, P-40, and P-47 aircraft in October 1943 and began training. It was disbanded shortly after leaving Abilene on 1 April 1944. On 25 March 1944, Republic P-47 Thunderbolt training for flight cadets was taken over by the 261st Army Air Force Base Unit. Training continued until 1 April 1946. With the end of the war, the base was declared inactive on 31 January 1946. Although assigned to Continental Air Command, Abilene AAF was classified as an inactive sub-base of Fort Worth Army Airfield and was sold to the city of Abilene for $1. It was used as a training facility for the Texas Army National Guard for several years. Shortly after the Korean War broke out, the city of Abilene called for the need of a military installation. They believed the 1,500 acres (6 km²) of the former Tye AAF were the perfect site for a new base. The city's leaders went to The Pentagon with their request. The city showed their determination for a new base by raising almost $1 million to purchase an additional 3,500 acres (14 km²) adjacent to the site. They were able to attract U.S. Senator Lyndon B. Johnson's (D-TX) attention, who had the power to persuade military officials to reactivate the base in Abilene. Finally, in July 1952, Congress approved the $32 million needed to construct an Air Force Base on the Tye AAF site. It was to be called Abilene Air Force Base and a little over three years after first starting construction, the base was opened on 15 April 1956. Dyess' first active combat unit was the 341st Bombardment Wing, which activated on 1 September 1955. The 341st was part of the Strategic Air Command (SAC), flying the B-47 Stratojet, which it continued to operate until its inactivation on 25 June 1961. On 1 December 1956, the name of the base was changed to "Dyess Air Force Base" in honor of the late Lt Col William E. Dyess, USAAF. The 96th Bombardment Wing moved to Dyess on 8 September 1957 and for a few years worked alongside the 341st. It included not just B-47 and B-52 nuclear bombers, but also the KC-97 and later on the KC-135 refueling aircraft. During the Cold War, the base was constantly on alert in case of nuclear attack. There were even signs in the base's movie theater that would instantly alert pilots in the scenario that the USSR would initiate a nuclear attack during a movie. These can still be seen today at the theater. During the Vietnam War, B-52's and KC-135's (917th ARS) from the 96th BW participated heavily in various air campaigns, including Arc Light, Young Tiger, Bullet Shot, Linebacker and Linebacker II missions over North and South Vietnam. The B-52's flew combat missions primarily out of Anderson AFB, Guam and Utapao RTAFB, Thailand during these missions. The KC-135A's flew primarily out of Utapao RTAFB, Thailand, Clark AFB, Philippines, Kandena, AFB, Okinawa, Anderson AFB, Guam and NAS Agana, Guam. On 19 November 1959, the United States Army conducted groundbreaking ceremonies at Dyess AFB for the battalion headquarters of the 5th Missile Battalion, 517th Artillery of the U.S. Army Air Defense Command. Installed to defend the SAC bombers and Atlas F missile silos stationed at and around Dyess AFB, the two Nike Hercules sites were controlled by a "BIRDIE" system installed at Sweetwater Air Force Station. Site DY-10, located at Fort Phantom Hill 32°34′49″N 099°43′02″W﻿ / ﻿32.58028°N 99.71722°W﻿ / 32.58028; -99.71722 and site DY-50, located southwest of Abilene 32°16′17″N 099°57′32″W﻿ / ﻿32.27139°N 99.95889°W﻿ / 32.27139; -99.95889, remained operational from 1960 until 1966. Units stationed at Dyess Air Force Base while the 5/517th was operational included SAC's 819th Strategic Aerospace Division, the 96th BW, and the 578th Strategic Missile Squadron. Several of the 578th's Altas F Silos are located near the Nike sites. The Army Air Defense Command Post was located 37 miles west at Sweetwater AFS. Both of the sites were located near former Army posts. Camp Barkeley served as a World War II infantry division training center, while Fort Phantom Hill was a frontier outpost and stop on the Butterfield stage route. C-130 aircraft depart from in a Minimum Interval Takeoff at Dyess during a mass airdrop exercise, December 1988. Since 1961, various models of C-130 Hercules aircraft have been stationed at Dyess AFB. The C-130s were originally assigned to the 64th Troop Carrier Wing (TCW) and from 1963 to 1972, the 516th Troop Carrier Wing was the host C-130 wing. In 1972, the 516 TCW was replaced with the 463d Tactical Airlift Wing (463 TAW). During the Vietnam War, TAC C-130 crews routinely rotated to forward based C-130 wings in the Pacific theater to support operations in Vietnam. In 1974, the 463 TAW was reassigned from Tactical Air Command TAC to Military Airlift Command (MAC) as part of a USAF-wide initiative to place both strategic and tactical airlift assets under MAC control. From 1962 to 1965 Dyess Air Force Base had 13 SM-65 Atlas Missile sites Stationed around it. The Dyess sites were operated by the 578th Strategic Missile Squadron. After being decommissioned in 1965, the Atlas missiles were removed and all sites demilitarized. In June 1985, the 96th received its first B-1B Lancer replacing the B-52 Stratofortress and in October 1986, assumed nuclear alert status. Since achieving IOC, Dyess has been recognized as the premier bomber training center and leads the fleet in maintaining the highest mission capability status of its aircraft, avionics test stations and support equipment. Shortly after, the Soviet Union fell and left many wondering the fate of the base. In 1991 the 463d Tactical Airlift Wing was simply designated the 463d Airlift Wing (463 AW). In October 1992, the parent commands of both wings changed. The 96 BW being reassigned to the newly established Air Combat Command (ACC), and the 463 AW being assigned to the new Air Mobility Command (AMC). The No. 2 ship of the C-130 Avionic Modernization Program from Edwards Air Force Base, Calif., visited Dyess 27 November 2007. The program will update the avionics on more than 400 C-130s. Part of the program includes new navigation system, a heads-up display, an all-digital cockpit, and other technology advances. On 1 October 1993, the 96 BW and 463 AW were both inactivated and replaced by the 7th Wing, a former B-52 and KC-135 wing that had been located at the former Carswell AFB which was being realigned as NAS Fort Worth JRB/Carswell ARS as a result of Base Realignment and Closure (BRAC) action. The 7th Wing incorporated Dyess' B-1Bs and C-130s, the latter which transferred from Air Mobility Command to Air Combat Command. Within its first year, the 7th Wing's diverse mission made it one of the most active units in the United States Air Force. The C-130s were deployed around the globe performing several airlift missions to Europe and the Persian Gulf. The crews and support people of the B-1s focused on enhancing the purpose of the Lancer in a post-Soviet 21st century. In the 1997, Dyess' C-130s were transferred back to Air Mobility Command, and the 317th Airlift Group was created as the parent unit for Dyess' C-130 squadrons. At the same time, the 7th Wing was redesignated the 7th Bomb Wing. Despite this separation as units, both the 7th Bomb Wing and the 317th Airlift Group remained at Dyess. One of the many unique features of Dyess is its extensive collection of static military aircraft on display. Collectively known as the "Linear Air Park," it contains 30 aircraft from World War II to the present, many of them formerly based at Dyess, and is located along the base's main road, Arnold Blvd. All but one plane has been flown before. Its most recent addition is the first operational B-1B Lancer, known as "The Star of Abilene," which made its final flight in 2003. It can be seen at the front gate to Dyess along with a recently retired C-130 Hercules located on the other side of the road (a tribute to the two main aircraft currently housed at Dyess). Another unique feature of Dyess is its main source of energy. In January 2003, Dyess became the first Department of Defense installation in the United States to be powered exclusively from renewable wind energy. Today, most of the energy Dyess receives is from other sources of renewable energy, such as biomass, and is considered one of the "greenest" bases in the U.S. Air Force. The remnants of Tye AAF can still be seen today. Parts of the old runway still exist as well as part of its parking area on the west side of Dyess. The 7th Bomb Wing and 317th Airlift Group were called to duty once again shortly after 11 September 2001. Both played and continue to play vital roles in both Operation Enduring Freedom and Operation Iraqi Freedom. Many of the 7th BW's B-1s and support personnel deploy to Southwest Asia. From there the 7 BW provides close air support to troops in the field and precision strike missions with the B-1B Lancer. The 317th Airlift Group has been deployed continuously to Southwest Asia since December 2003 where the group provides airlift support to OIF, OEF and Combined Joint Task Force-Horn of Africa operations. On 1 October 2015, Dyess became part of Global Strike Command. The 578th Strategic Missile Squadron operated twelve missile sites, of one missile at each site. This article incorporates public domain material from the United States Government document "Dyess Air Force Base". ^ "Comrades Pay Final Tribute to Lt. Col. William E. Dyess". Los Angeles Times. 25 December 1943. ^ Jensen, Will (28 September 2015). "Ceremony at Dyess marks transition within U.S. Air Force". KTXS-TV. Retrieved 1 October 2015. Wikimedia Commons has media related to Dyess Air Force Base. This page was last edited on 5 November 2018, at 23:20 (UTC).